The 1931 Mille Miglia was won by Rudolf Caracciola and Wilhelm Sebastian in a Mercedes-Benz SSKL, the first foreign overall winners of the Italian race. Mercedes-Benz has signed on as the main automotive sponsor of Mille Miglia. An agreement was reached between Mercedes-Benz Classic and 1000 Miglia S.R.L. in Brescia (Italy), with the aim of establishing a long-term collaboration. Mercedes-Benz Classic will be represented at the 2013 event with a number of vehicles, as well as five famous faces taking up their position at the starting line. Marcel Tiemann will also be representing Mercedes-Benz Classic as a brand ambassador at this year’s Mille Miglia, alongside former Formula 1 racing drivers David Coulthard, Jochen Mass and Karl Wendlinger, as well as Bernd Mayländer, the current driver of the Official F1 Safety Car. 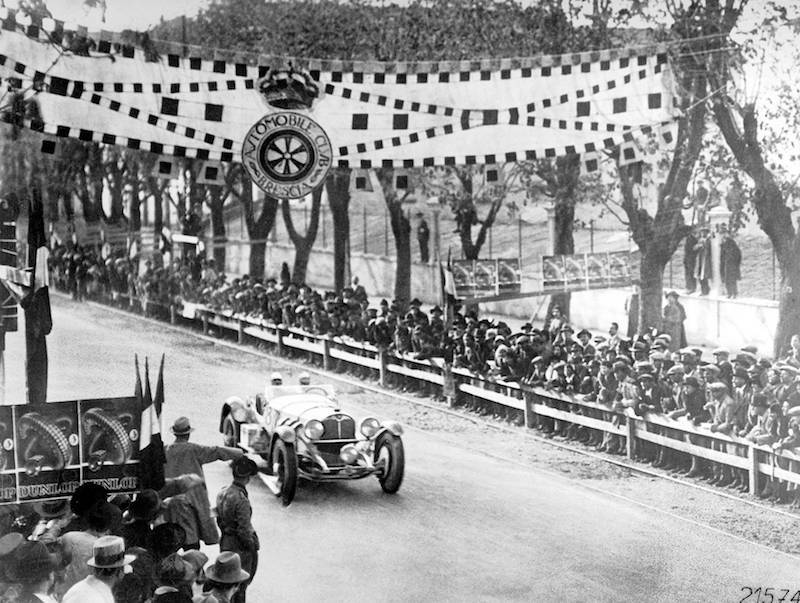 One of the major triumphs celebrated by Mercedes-Benz at what is probably the most famous thousand-mile race was the legendary victory by Rudolf Caracciola in April 1931 as the first non-Italian driver, together with his co-driver Wilhelm Sebastian in an SSKL racing car. The second major success from Mercedes-Benz involved the 300 SLR (W 196 S). In 1955, Stirling Moss and his co-driver Denis Jenkinson won the Mille Miglia with the vehicle sporting the starting number 722. Travelling at an average speed of 157.65 km/h, they completed the course in the fastest ever time of ten hours, seven minutes and 48 seconds. Juan Manuel Fangio with starting number 658 took second place, completing the race solo. Today, the Mille Miglia is promoted as a test of endurance, stretching from the northern Italian town of Brescia to Rome and back. Along the thousand-mile course (around 1600 kilometres), a number of challenges await the participants and their classic cars. The rules state that only vehicle models which were part of the original race line-up (1927 to 1957) are permitted to take part. Taking place at the same time as this year’s Mille Miglia, there will be an exhibition of the Daimler Art Collection from 7 March to 30 June at the Museo di Santa Giulia in Brescia, entitled “Novecento mai visto: From Albers to Warhol to (now)”. Taking centre stage at this event are more than 230 works from around 110 international artists. This exhibition will also be accompanied by a special show in Museo Mille Miglia where three original vehicles from Mercedes-Benz Classic will be exhibited together with corresponding Warhol motifs. Allowing Mercedes-Benz to monopolize the Mille Miglia starting this year is a terrible decision by the organizers of 1000 Mille S.L.R….a “sellout” grab for the almighty Euro. Having participated in the event in the last several years I can personally testify that Mercedes, BMW and Audi did all they could to psychologically flood the event with their cars (no one needed to see 10 300 SLs for example), dozens of technical chase cars, massively large static displays of current and historic offerings, the distribution of 20,000 little hand-held flags planted around the circuit and in the hands of spectators …and in general the smothering of any free association of the history of the event to any other marque without seeing the three pointed star, the four rings or the propeller symbol. Now, with the power of lead sponsor, Mercedes Benz has the opportunity to “own” the entire event and effectively change the event’s name to the Mercedes Benz Mille Miglia. A destructive act and a “sellout” that the organizers did not have to resort to. To follow up on the above – the Mercedes team last year was the most rude of any of the drivers on the road. The traveled in packs and passed in a packs and did not care what was coming on the other side. Everyone else I met and drove against acted as you would expect with courtesy – but not them – hands down a very poor display for the brand! We will see this year if they changed – but I doubt it as been told this is their MO! I love Mercedes-Benz. The ‘Best or Nothing’ forever !!! I have a great fondness for the marque, but out of respect for the history of the event, I agree this was an extremely poor decision. With Mercedes-Benz as sponsor, an indelible corporate bias is now introduced to an event which gains so much cache from being manufacturer-neutral – a celebration of ALL marques which have participated through the years. This decision casts a silver shadow over what could -and should- be a richly colored event. If Mercedes-Benz could forego marque-specific advertising and define the event through neutrality – focusing on Mile Miglia- the long term credibility and respect gained would recoup vast sales potential. As it is, in this kinetic, short-sighted race, I doubt such will happen. ‘T’would be nice to see MB stand as tall now as they stood then and use their past history as the lightpost, correctly: illumination and not support. See you in Brescia Bob!!!!! Sorry I am not anonymous on the above comment!!!! I am with you all the way, I can confirm that the promotion cars with the drivers were a real PITA. We all like pretty girls and cars, but at the Mille Miglia we like to keep the focus on the classic cars. The Mercs and Beamers and Audis and some other modern car makes. block the roads, don’t reespect the vintage racers, the (/pretty) drivers are often occupied woth the smart phoes and seem to have very little knowledge about how to perform. Give us back the traditional 1000 Miglia and don’t ruin it for the sake of a few Dollars or Euros. As CEO of 1000Miglia S.r.l., I would like to reassure everyone, and Mr. Little in particular, that the Mille Miglia will continue to be a celebration of all the cars, all the brands, and specially all the drivers that made its history in the period 1927-1957. Mercedes-Benz have been sole automotive partner for the Mille Miglia retrospective for about 14 years in the late ’90s and early 00’s – and the event has never been a “Mercedes Benz Mille Miglia” as you suggest: there is no reason why this should happen now, and rest assured that we would make sure this does not happen. Besides, a very strong Mercedes identification would be in nobody’s interest – least of all in Mercedes’. What happens at Villa d’Este (a BMW-owned and -organized event)? Every car is welcome and nobody complains about it being too blue-and-white. Organizing the Mille Miglia is very complex and very expensive, much more expensive than it was back in the times it was a real race. Just imagine hotels and meals for close to a thousand people, not mentioning all the behind-the-scenes work we make to make sure no excessive risk is run, and everybody ariives happily in Brescia. It simply would not be possible without a strong sponsorship base. This year we have made a public offer for the main automotive sponsorship to a dozen manufacturers with a Mille Miglia past, and only received an offer from Mercedes-Benz. We are very happy and proud that such a world-class organization (they have more or less invented the motor car, by the way…) has decided to back us and we are sure we will have a great future together. Finally, if you do not like seeing ten 300 SLs roaring past, you are lucky for not having been around in Italy in the Fifties, as in the 1955 Mille Miglia there were 9 of them, twelve in 1956 and eleven in 1957. You would have seen also hundreds of humble little Fiats and Etceterinis disintegrating along the route. We have done our best (in a very short time, and with very strong opposition from many directions) to ensure a great present and a even better future to the Mille Miglia, and this also means that the value of the event has to be defended, as it belongs to Automobile Club Brescia, itself a public entity – thus belonging to all Italians.
. A responsive comment had been received by the CEO of the 1000 Miglia S.r.l. In his response he mentioned the absolute requirement for more funds to cover the spiraling cost of the event, notwithstanding the $9500 per car entry fee x 415 cars that brings in ~$4,000,000, the sponsorship of the Chopard jewelry firm and the dozens of other smaller sponsors. I cordially invite anyone who actually attended the event this past week to share your opinion as to the level of ‘event hijacking’ by Mercedes-Benz that might have occurred at this years’ event…..as I witnessed personally the last several years before the German car manufacturer contracted to become the official event sponsor. I did not participate in this years’ event. Yours for a better 2014 Mille Miglia.